There is a long history of religious thinking and attention to the role of humans as stewards of the Earth and the environment. The Evangelical Environment Network, for example, is a ministry of Christian people and organizations aimed at reducing pollution and environmental degradation. The theological underpinnings for the network stem from the idea that God created Earth and humans, therefore, God’s children have a responsibility to care for his creations. This perspective is shared across a number of faiths. Early in President Barack Obama’s first term, the White House Office of Faith-Based Initiatives established a task force for religious organizations to address the effects of climate change on the environment and the American population. And, in June 2015, Pope Francis issued an encyclical urging Catholics and all people on Earth to focus on a broad range of issues and problems in the environment including pollution, climate change, biodiversity and global inequality of ecological systems. Previous Pew Research Center studies have found only a modest effect of religion on attitudes about environmental protection. For example, a 2010 Pew Research Center telephone survey of U.S. adults found 81% of all adults, including strong majorities of all major religious traditions, favored “stronger laws and regulations to protect the environment,” while 14% opposed them. While 47% of those who attend worship services at least once or twice a month said their clergy speak out on the environment, few adults described religion’s influence as most important in shaping their thinking on environmental protection. Just 6% of U.S. adults in the 2010 survey said religious beliefs have had the biggest influence on what they think about “tougher laws to protect the environment.” More said the biggest influence on their views has been education (28%), the media (24%), personal experience (18%), or something else (11%). Another 6% said friends or family had the biggest influence on their views. When it comes to people’s beliefs about climate change, it is the religiously unaffiliated, not those who identify with a religious tradition, who are particularly likely to say the Earth is warming due to human activity. 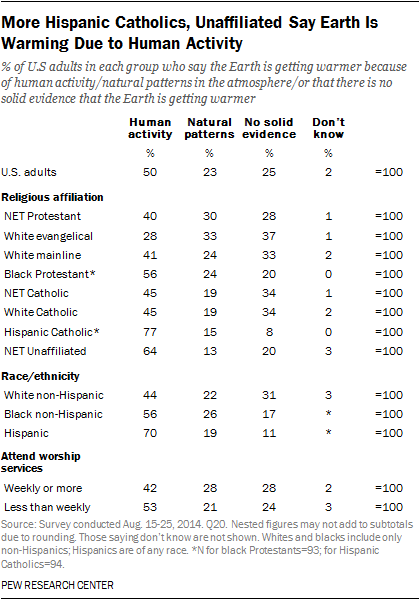 Hispanic Catholics, like Hispanics in general, are more likely to say the Earth is warming due to human activity. White evangelical Protestants stand out as least likely to have this view. However, in multivariate statistical modeling, the major religious affiliation groups did not differ from the religiously unaffiliated in views about climate change. Political party identification and race and ethnicity are stronger predictors of views about climate change beliefs than are religious identity or observance. The Pew Research Center survey asked respondents to pick which of three options best described their views about climate change. Overall, 50% of adults say climate change is occurring mostly because of human activity such as burning fossil fuels, 23% say climate change is occurring due to natural patterns in the Earth’s environment, and 25% say there is no solid evidence that the Earth is warming. Pew Research asked this same question in 2009 and found that about the same share of U.S. adults (49%) said the Earth is getting warmer due to human activity, while fewer said there is no solid evidence the Earth is getting warmer (11% in 2009 compared with 25% today). And more said warming is occurring due to natural patterns in the environment (36% in 2009 compared with 23% today). Views about climate change vary by religious affiliation and level of religious observance. Hispanic Catholics (77%), like Hispanics overall (70%), are particularly likely to say the Earth is warming due to human activity. Most of the religiously unaffiliated (64%) and 56% of black Protestants say climate change is mostly due to human activity. By comparison, fewer white mainline Protestants (41%) view climate change as primarily due to human activity. White evangelical Protestants are least likely to hold this view; 28% among this group say the Earth is warming primarily due to human activity, 33% say the Earth’s warming is mostly due to natural patterns, and 37% say there is no solid evidence that climate change is occurring. There are modest differences by religious observance in views on this issue; 42% of frequent churchgoers attribute the Earth’s warming to human activity, compared with 53% among those who attend services less regularly. The Pew Research survey also asked half of the respondents about their views on climate change using a more nuanced series of questions. First, respondents were asked for their views about whether there is solid evidence the average temperature of the Earth has been getting warmer over the past few decades. Those who said there has been warming were then asked whether such warming is mostly due to human activity or mostly due to natural patterns in the Earth’s environment. (For more on these results see “Public and Scientists’ Views on Science and Society.”) The pattern of findings by religious tradition and observance are similar on this set of questions. A majority of the U.S. public perceives scientists as generally in consensus about climate change. Most adults – 57% – say scientists generally agree the Earth is getting warmer because of human activity, while 37% say scientists generally disagree that human activity is the cause of the Earth getting warmer. The general public’s perception has fluctuated in the past several years, reaching a low in 2010 of 44% who said that scientists generally agree human activity is the main cause of warming temperatures. As shown in Pew Research Center’s report “Public and Scientists’ Views on Science and Society,” public perceptions on this issue tend to be associated with individual views on the subject. Those who believe the Earth is getting warmer due to human activity are most inclined to see scientists as in agreement on this point, while those who believe the Earth’s warming is due to natural patterns or that there is no solid evidence are more likely to see scientists as divided. Hispanic Catholics, followed by the religiously unaffiliated, are especially likely to perceive scientists as generally agreeing that the Earth is warming due to human activity. White evangelical Protestants are closely divided, with 45% saying scientists generally agree and 47% saying scientists generally do not agree about this. There are no differences in perceptions of scientific consensus on this issue by frequency of church attendance. A multivariate logistic regression, not shown, found neither religious affiliation nor frequency of attendance significantly predict perceptions of scientific consensus about climate change. Turning to energy issues, the Pew Research Center survey finds 52% of Americans favor allowing more offshore drilling in U.S. waters; 44% are opposed. Fully seven-in-ten white evangelical Protestants and 66% of white mainline Protestants favor allowing more offshore oil and gas drilling. Support is lower among black Protestants (46%), as it is with blacks overall (45%). Hispanic Catholics (44%), like Hispanics overall (40%), are similarly less inclined to favor more offshore drilling. The religiously unaffiliated stand out for their lower levels of support: 37% favor and 60% oppose allowing more offshore drilling. Regular churchgoers are more inclined than those who attend church less frequently to favor more offshore oil and gas drilling (57% vs. 50%). Pew Research Center’s report, “Americans, Politics and Science Issues,” finds strong differences among party and ideology groups on views about offshore drilling. Upwards of seven-in-ten Republicans and independents who lean Republican favor offshore drilling (72%) compared with 39% of Democrats and leaning Democrats. A multivariate logistic analysis controlling for political and demographic factors, not shown, finds both evangelical and mainline Protestants (of any race) more likely than are the religiously unaffiliated to support more offshore drilling. Frequency of church attendance is not a significant predictor of views on this issue with other factors controlled. The general public is closely divided when it comes to opinions about nuclear power. About half of adults (51%) oppose building more nuclear power plants to generate electricity, while 45% are in favor. Support for building more nuclear power plants is down modestly from 2009, when 51% were in favor. Black Protestants stand out from other religious groups for their greater opposition to nuclear power; 65% of this group (and 62% among blacks overall) oppose more nuclear power plants, while 31% are in favor. Protestants overall are closely divided on this issue with 47% of Protestants in favor and 48% opposed. A 57% majority of the unaffiliated oppose building more nuclear power plants, while 39% are in favor. There are modest differences by religious observance in views about nuclear energy: 49% of regular churchgoers favor building more nuclear power plants compared with 43% among those who attend services less often. A multivariate logistic regression analysis, not shown, found no differences by religious affiliation or frequency of church attendance in views on nuclear power, when controlling for political, educational and demographic factors, however. A majority of the public supports one newer form of energy development: Fully 68% of adults favor the increased use of genetically engineered plants to create a liquid fuel replacement for gasoline, while 26% oppose it. Adults across all major religious groups are in favor of using genetically engineered plant fuel as a replacement for gasoline. White mainline Protestants are especially likely to favor this (78% do so). Views towards the increased use of bioengineered fuel alternatives to gasoline are about the same among those who attend church services more and less frequently. The religiously unaffiliated stand out for their lower levels of support of fracking; 28% of this group favors increased fracking, while 64% are opposed. Lower support for fracking also is seen among Hispanic Catholics (33%) and among Hispanics overall (32%). Protestants are closely divided on this issue, with 46% in favor and 43% opposed to increased fracking. There are modest differences in views about fracking by religious service attendance; 53% of those who attend services less regularly oppose the increased use of fracking, compared with 45% among those who attend services at least weekly. A multivariate logistic regression, not shown, found mainline Protestants (of any race) more likely to favor fracking compared with the unaffiliated, when controlling for political, educational and demographic differences. Frequency of church attendance is not a significant predictor of views about fracking in this modeling. The Pew Research Center survey included one question that asked Americans to think about the relationship between global population growth and natural resources. A 59% majority of Americans say world population growth will be a major problem because there won’t be enough food and resources to go around, while 38% say world population growth will not be a major problem because we will find a way to stretch our natural resources. Views on this issue vary across religious traditions. Most black Protestants (60%), and black adults overall (57%), take an optimistic view that new solutions will emerge to address the strains on natural resources caused by a growing world population. The unaffiliated (76%), followed by white mainline Protestants (63%), are more likely to see the growing world population as leading to a major problem. Less-frequent churchgoers are more inclined to say global population growth will be a major problem; 63% say this, while 35% say the world will find a way to stretch its natural resources. By comparison, 51% of adults who attend church weekly or more say world population growth will be a major problem; 45% say otherwise. A multivariate logistic analysis, not shown, finds religious group to be a significant predictor of views on this issue. Compared with the unaffiliated, evangelical and mainline Protestants (of any race), as well as Catholics and other Christians, are more likely to say world population growth will not be a major problem because we will find a way to stretch our natural resources.